A good month to spot the mini masters of the air. In European countries, throughout the ages, dragonflies have had a bit of a rough ride, with such names as Devil’s Darning-Needle and Horse-biters. And even though their name conjures up images of the great fire-breathing beasts, dragonflies are in fact, harmless. Once you’ve spent time with these fellows, observing them in flight, at rest, up close and at a distance, I’m sure you’ll fall in love with them. I did, mainly due to an intention to get a decent shot of one. After the first shot, I wanted more, and more, until my summers are spent at every body of water I can reach, camera in hand. Despite the reputation and stories they will not bite, nor sting and should you be lucky enough to have one land on you, don’t be scared, be honoured that one has chose you to rest on. They are fragile, so be careful not to hurt them. I have had the honour of a Common Darter land on my hand, but this takes patience, sitting still and waiting to be accepted as part of its territory. Their eyes are sensitive to motion, so any twitch could send them off again. Orthetrum cancellatum black (Black Tailed Skimmer) . Image by Carl Jervis. The average lifespan of dragonflies (and their close cousins, damselflies) is around 2 years. Most of this time is spent as a nymph, in water. In ponds and rivers all over the world, these nymphs are vicious predators, tackling prey up to their own size! A session pond skimming may reveal these nymphs, looking very alien like, and certainly not what you would call attractive! After two years underwater, when conditions are right, the nymph will clamber up a reed, where it begins its transformation into an adult. Careful observation at the edge of a pool can reveal the shells from the nymph, called exuvia. With a lot of luck and patience, they can be seen emerging from their nymph stage on the reed! This can take several hours to achieve, giving a great opportunity for observing these beautiful creatures up close and personal. This is a difficult time for dragonflies, as their body is soft, their wings not strong enough for flight. At this stage, other creatures will find them easy prey. Many, however, survive enough to full adulthood. For several hours though, they have yet to receive their full colours, remaining dull, brown coloured. This is called the Teneral stage. The shot to the right shows a teneral Black-tailed Skimmer. After a few hours, his body will become powder blue, the eyes turning a blue-green colour. Definitely more attractive in flight! 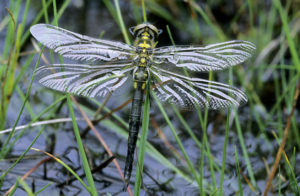 Though showing a preference, dragonflies are strong fliers, and can be seen at some distance from suitable bodies of water. Most sightings however, are near bodies of water. And they don’t appear to be too fussy on the whole! A walk down the canal or river, around a pond or lake, will almost certainly guarantee sightings. Warm, still summer days are the best and early morning or evening will see many species sunning themselves on vegetation prior to either hunting or sleeping. And careful study of them in action can in many cases, identify the groups of dragonflies. Hawkers and Emperors scout areas in straight, swift lines, turning right angles almost instantly. Chasers and Skimmers fly low over bodies of water and finally Darters spend a lot of time on the tops of flower heads and reeds until prey flies past, at which point they “dart” out to catch them. Unlike damselflies which can be seen in great numbers in one spot, dragonflies tend to be territorial. Sit beside a pond where one is hunting and wait. Eventually another will arrive, and the battle commences. This is the time you’ll see the real mastery of flight, as they dive and wheel like fighter aircraft. 2006 saw on of my best sightings of this behaviour, when about 8 Migrant Hawkers were in a very small area by the River Trent. Watching the dogfight was like watching the Battle of Britain! Bear in mind that dragonflies have been doing this for hundreds of millions of years, much longer than birds, and have plenty of time to perfect the art. Two pairs of wings allow them to direct both the airflow and their bodies with such manoeuvrability, few creatures can match them. Which leads on to another sight you may be lucky to view around dragonflies – the Hobby. This small falcon is a bird that has mastered precise flight. 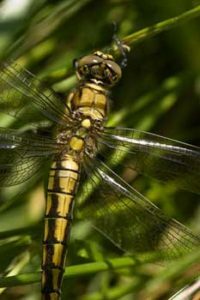 Its prey is dragonflies, often catching and eating on the wing. 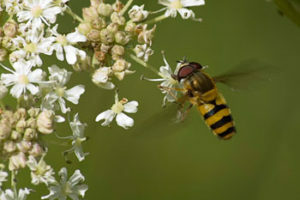 Hoverfly. Image by Carl Jervis. A couple of things to know about shooting these creatures. Firstly, you don’t need expensive gear to get great shots. Although I use a DSLR, the lens I capture most of my shots on was less than £100. Most compact cameras have a macro mode, but require you to get very close indeed to fill the frame. Worth a try though. Secondly, they have very good eyesight, so stalking them is the order of the day. Move slowly, and instinctively know the minimum focusing distance of the camera. This way you’ll be able to get the shot, but without being so close as to scare them away. Depth of field (how much is in sharp focus) is vitally important when shooting close up. For this reason, the best shots require either a side on angle, such as above or from on top of the subject as shown in the images below. This will ensure pleasing levels of sharpness on the subject. The main bonus is that the background blurs into a smooth, featureless drop to display the subject on. As mentioned before, shooting early morning or evening, when they are less active, will generally guarantee great results as the ability to shoot off into the distance is lessened. This is true of butterflies too. If you’re really early and lucky, close up shots featuring dew on the insect will always look spectacular. Even though light levels in the summer can be high, they’re not guaranteed, especially in a tree lined pool. Having a camera with stabilisation is great, allowing flexibility on the move. Otherwise, a very flexible tripod becomes almost essential. Alternatively, spend a little time sat by water with a pencil and paper, and sketch dragonflies around you. A few pencil strokes can be sufficient to mark out the shape, shading and notes on colour, size, and markings can be all you need to identify your sighting.